Not all Bertie’s stories work their way up into series. There are our one-offs. 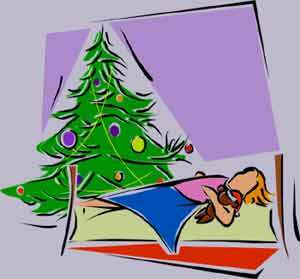 A modern Christmas story about how two children, Harry and Rosie tricked Santa – a free mp3 for kids. Natasha reads two very special stories were written by the young winners of Bertie’s Christmas Storynory Writing Competition. As it happens, both stories are about dolls – but the tales are very different. So well done Alisa Pullum and Michelle Dufflocq! The big sister was called Debbie. And the little sister was called Daisy. Debbie was seven. And Daisy was four. And one day Daisy wished that she could be the big sister…. Christmas is the happiest time of year, but sometimes something terrible happens – like a kid misses it all together. That’s what happened one year to a girl called Natalie. How a boy called Jason spent Christmas in a very special land where Santa doesn’t visit – but where they do have 13 Christmas imps who bring presents. When Jack starts to cut eyes and a mouth into his pumpkin, he is in for a big Halloween surprise.